Alive and Young: Away too long. I've been away too long. 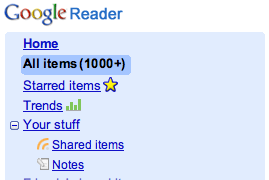 I think it is going to take me a long time to go through my Google Reader account. Apparently it stops counting new entries at 1000, so who knows how many posts I have to go through. I know that Google Reader feeling. It's best to treat reader like a box of chocolate candies. Don't try and eat all the blog feeds at once or you'll end up dazed, unfulfilled, and feeling a little guilty.